The sub-band structure of the echo path replica generation is essentially split into several (often many) bands resulting in dividing up the eigenvalue spread, so the spread in each band is much smaller. The adaptation within the individual bands proceeds using a similar approach as in the case of the full-band adaptation, when using an adaptation algorithm of choice (such as NLMS). If more complex adaptation algorithms are considered (for example, proportional NLMS, which only slightly deviates from the NLMS), then they can be used in sub-bands as they would be used in the full-band adaptation. A sub-band based adaptive filter, in an application for cancelling acoustic echoes, is shown in Figure 1. 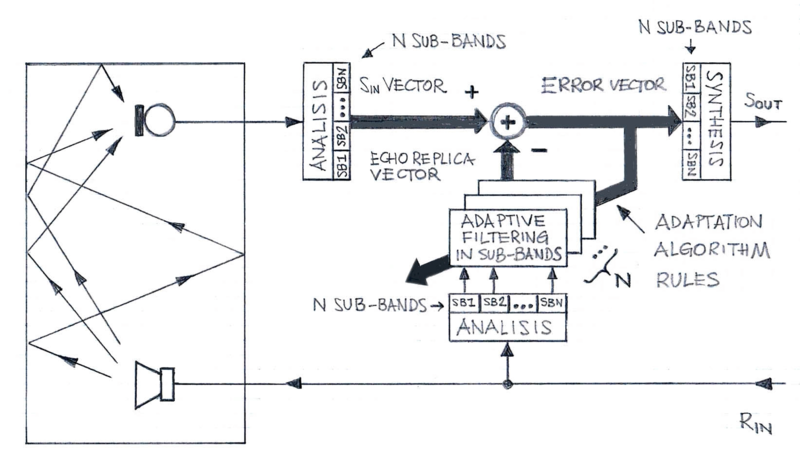 The incoming signals to the adaptation block are passed through the sub-band analysis stage; then the adaptation process is performed using the adaptation algorithm of choice. Then the individual error signals are combined in the synthesis block.Although the computation cost can be effectively mitigated by down-sampling of sub-band signals, there is a moderate cost increase due to splitting the adaption into many sub-bands. VOCAL’s Sub-band Acoustic Echo Canceller design has been successfully tested in typical acoustical environments and is deployed widely. It is available for a range of DSP processors. Please contact us to discuss your acoustic echo cancellation needs.